In a product placement/integration stunt that should have felt forced but didn't, the first several minutes of last Thursday's Jimmy Kimmel show didn't begin with his monologue, rather, it began with a Nespresso ad featuring spokeswoman Penelope Cruz. As Jimmy gets ready for the show, he runs into Cruz -- along with the rest of his staff -- backstage and they're all hanging out drinking coffee. There's some witty banter and name calling as Kimmel laments the fact no one's working. Cruz convinces Kimmel to sit down and enjoy a cup of Nespresso. Kimmel enjoys the cup so much, he turns to Guillermo and says, "The show is yours." Wasting no time. Guillermo rushes onstage and begins the show. As product integrations go, it's not bad. 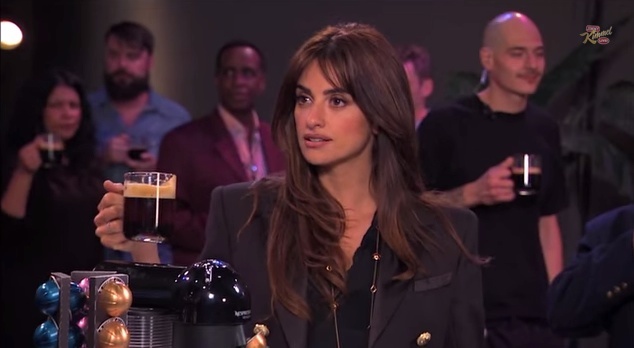 Yes, it's blatant commercialism but at least we get to see Penelope Cruz and there are a few funny jokes.